It becomes essential for studies of collision safety to acquire stress-distortion data,which depends on the deforming speed, in order to improve accuracy of CAE analysis. 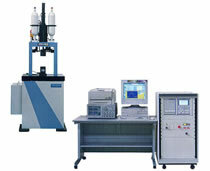 This new type compact test system can obtain stress-distortion characteristics in a wide range of deforming speed from quasi-static to high-speed. A special load sensing block which uses a unique principle can obtain a wide frequency range of clear waveforms precisely. Both tension and compression test can be available by replacing the jig.